I love giving men testosterone therapy when they need it. It can turn back the clock and take them from a lazy, out of shape, moody, mentally slow guy to a happy, energetic, mentally quick lean-and-mean machine. 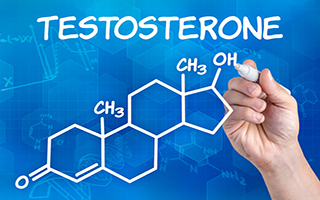 But a surprising study came out just this past week that indicates that there is one case where it might be better to let a man stay in his low testosterone state. Researchers recently reported on 87 men who had mild to moderate Alzheimer's disease. They analyzed how often the men had symptoms of hallucinations, delusions, excessive movements, and agitation and irritability. Then they checked their testosterone levels and divided the group up into those whose testosterone levels were below normal (less than 250 ng/dL) and borderline/normal levels (greater than 260 ng/dL). The results are staggering. So it looks like it would be a really bad idea to give testosterone therapy to men with Alzheimer's. Why? I think it is likely that their brains are just not able to deal with all of the stimulation that comes from testosterone. And here's the really ironic part of it all. Low testosterone levels is one of the factors that leads to Alzheimer's. So men, the moral here is don't wait until things start to go bad before you give testosterone a try. Start supplementing yourself as soon as you have the first signs of deficiency. The most common signs are: low libido, poor sexual performance, moodiness and decreased enthusiasm, fatigue, and decreased strength and stamina. If you have any of these symptoms, consult with a doctor well versed in testosterone replacement. You can find one at www.worldhealth.net. Hall JR1, Wiechmann AR1, et al. Total testosterone and neuropsychiatric symptoms in elderly men with Alzheimer’s disease. Alzheimers Res Ther. 2015 May 1;7(1):24.